Looking forward to setup the own commercial Advance Real Estate Android Application with easy property booking management, buying and selling the property with advanced mobile-friendly customization, the solution is here that the user’s recommended Real Estate Apps for Android is made live for the users to book their rental property in an efficient way by customizing the app in favor of the users and for the real-estate entrepreneurs with high-resolution graphics with professional world-class customized templates user-responsive android application. This app is mainly designed for the real-estate entrepreneurs to become profitable in their business by developing the online rental property app for their business leads. This Android real estate app is now high demand on sale among the real-estate competitors because nowadays the people are started to book their requirements from their place by doing a comparison between rental properties. So, it is a much-needed application for the real-estate entrepreneurs to promote their businessonline. This Real Estate Android Application can also help the new entrepreneurs to start their own advanced real-estate business without any guidelines. Here the users can register their account as the individual or the builder, where the individual users can register by submitting the valid mail id, password,locations, address etc. Then the user can find the home page where it contains property listings with the classifications like new properties, featured property etc, for the better useraccess. In this Android Apps for Real Estate Agents the users can search down their required property by entering the location or city, property category, sub-category,rooms, the minimum and maximum price for the property etc, which will response to the user queries with accurate results. Then the users can book their property by seeing the details and descriptions about the property by contact or send an enquiry. This Real Estate Apps for Buyers Sellers has another portal where the realestate agents or the builders can post their property by submitting the required details with the property license and proof. Then they can send their property request to the admin, the post which includes the property images, details, descriptions, contact details, etc. The builders can easily manage their booking management and can easily respond to the user enquiry. In our advanced Real Estate Android Application,the admin can easily manage all the management features and functionality in one place, the admin has the clear user interface and perfectly structure management features by managing the user, builder’s property listing and the booking management. The admin can add or remove the property listings with the easy management tools with mobile-friendly andbug-free customization. 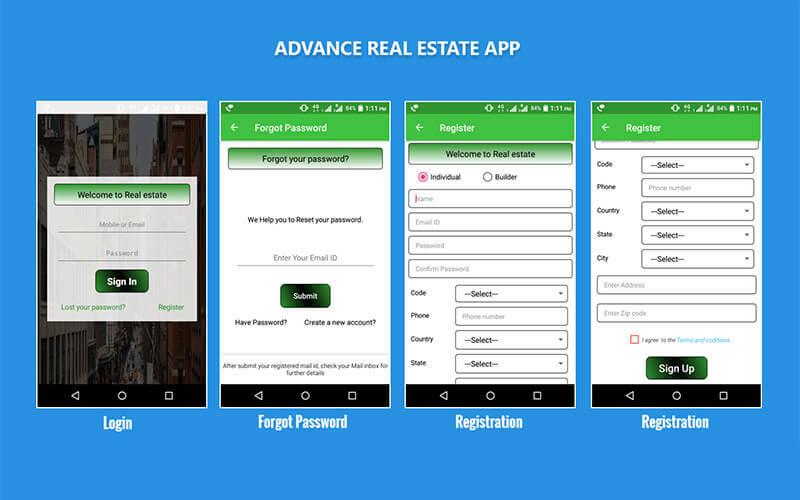 The idea behind this real estate android application is very good and the team members are promising and completely customized application on my suggestion. Still now it’s working better. Positive experience with this team and good designed features with no defects. I strongly recommend it for its functionalities and for team support. I have been using this application for past months, till now I haven’t experienced any disadvantages. Keep it up guys.